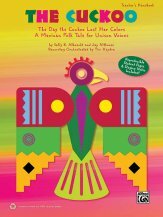 This captivating mini-musical will capture your young performers' imaginations, as a bevy of birds is given the task of collecting seeds before Fuego, the Mexican god of fire, clears the fields. The once colorful Cuckoo single-handedly saves the day, but in the course of events loses both her colorful feathers and her song, leaving her ashen gray and with only two notes. Learn how she is rewarded by her friends, including Buho the owl, Conefo the rabbit, Topo the mole, and all the birds of the field. An uplifting story, teaching both heroism and kindness. Recommended ages 2-7 Approx. time 20 minutes.